Detox teas are all the rage right now but what about good old fashioned water? Water infused with healthy detox veggies, fruits and herbs work just as good or better than a detox tea plus you get the benefits of these powerful ingredients in their pure, whole form to help detox your body, give you better digestion and soothe stomach cramping, ect. And it's cheaper to buy the ingredients then a detox tea. 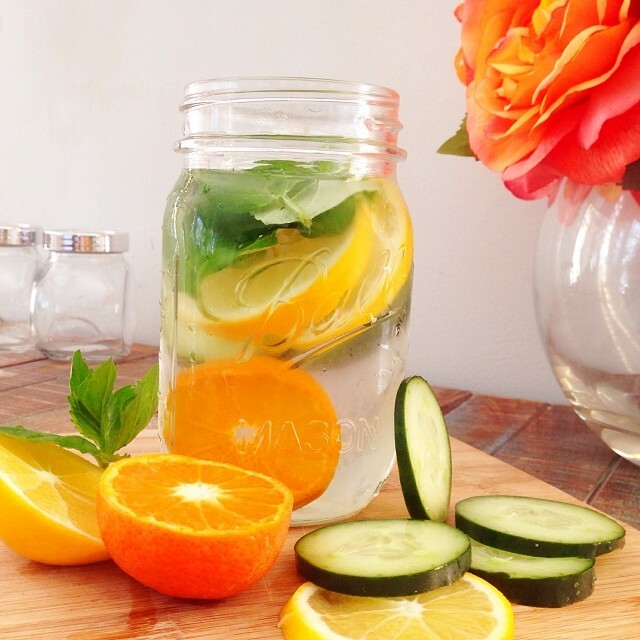 Detox water helps flatten your belly by removing toxins and improving digestion. It also helps to clear up acne, improve your immunity and so much more. Recently, I made a detox water and I loved it. If you like one ingredient more than something else it's great to switch up the ingredients with what you like. For example, in this recipe I've replaced ginger with orange. Add a little amount of each ingredient until you get the flavor you want for your water. Sample it and add more if you like. Try to finish off the water in one to two days. Empty out fruit, herbs and veggies after two days. Remake if you want and enjoy! Cucumbers have anti-inflammatory properties and prevent water retention. Orange juice stimulates the immune system and reduces cholesterol. Lemon cleans out the digestive system.